But have you ever tasted it? 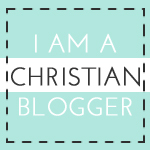 If not, then maybe you should! I have. I taste everything I've ever given my children including those nasty vitamins. If you have any experience with this you know the liquid is potent, strong smelling and very bitter to the tongue. How can you expect your baby or toddler to actually take this thing!? I bet, like me, you've tried mixing it into infant cereal or other foods. It doesn't mask the taste. It just makes the food yucky and brown. 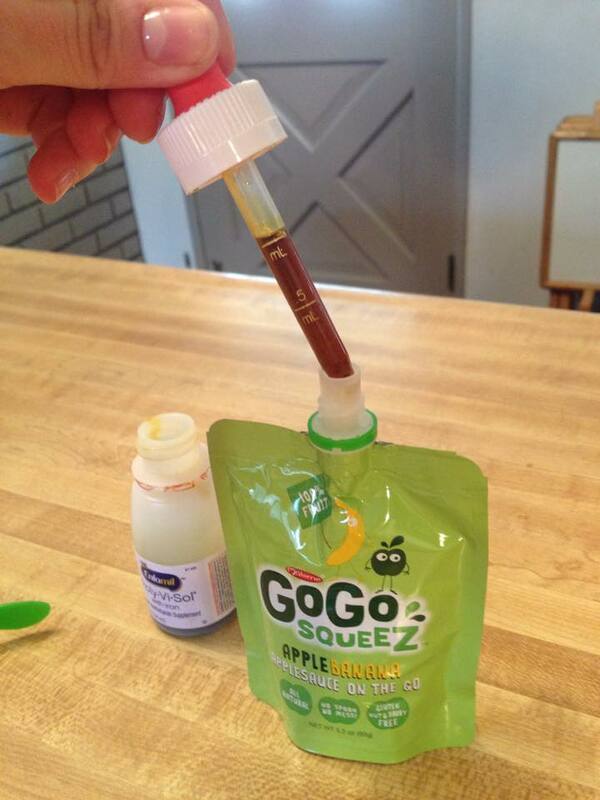 Maybe you've even held your kid's face still and just popped the little dropper in as quick as you can. I've tried that too. Maybe you've seen the same reaction to the taste, and maybe sometimes they've spit it out! ...And what about the mess it makes? The stains! Oh, the stains! Those vitamin drops are diabolical for laundry. The brown liquid quickly stains anything it touches- from clothing, to counter tops, even skin! 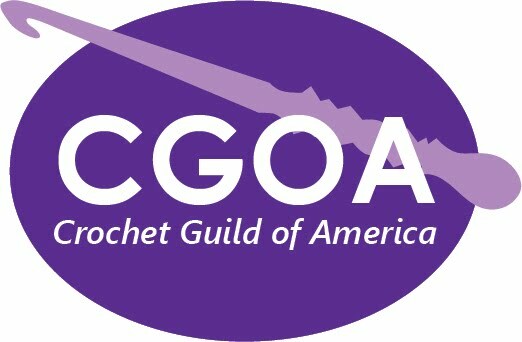 I thought for years, there has to be a better way! If you give it to your child straight, they spit and gag on the horrible taste. If you mix it into something you only ruin the flavor of what ever you're trying to mask it with. 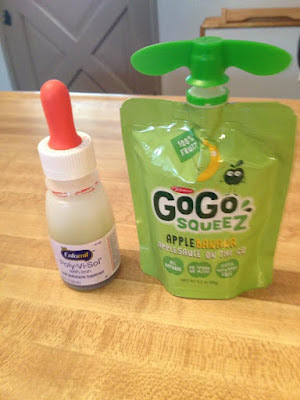 As sort of a combination of the pop-it-in and mask-it methods, I use the genius of the children's fruit or applesauce pouch to help you get yucky tasting vitamins down! When you open the fruit pouch, you'll notice there's a little bit of room at the top. Measure the vitamins and carefully drop them into the pouch right on top of the applesauce or fruit. Be careful not to squeeze or let your child squeeze. 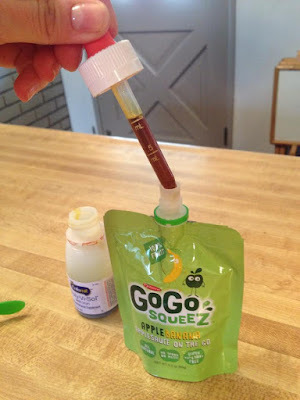 Just place the spout of the pouch in your child's mouth and let them begin sipping. The first mouthful they get will have the vitamins, and then be immediately chased with the sweet goodness of fruit! After the first sip you can let them hold the pouch. They'll gleefully enjoy the rest without having even known they've taken their vitamins! The trick is not letting them squeeze the pouch until the vitamins go down with the first sip. This can easily be a mess-free way to get the job done. Babies, toddlers and children need their vitamins. If you make this tip a part of your daily routine it'll become a beneficial habit. 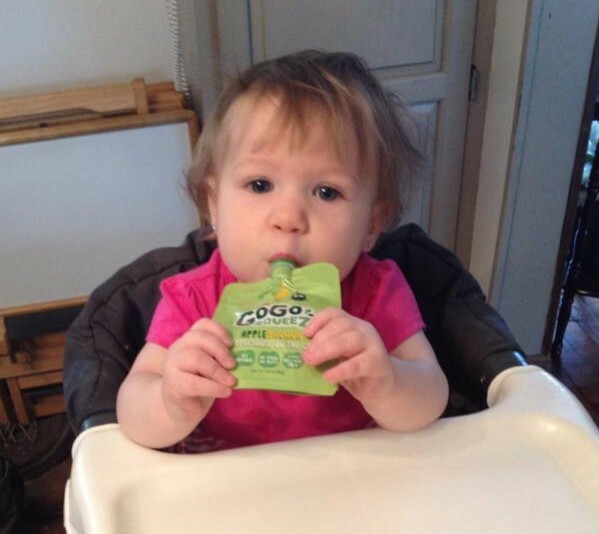 I serve my baby vitamin-laced fruit pouches at lunchtime daily. I hope this helps some of you moms and dads out there!